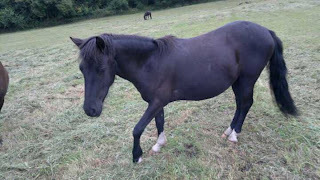 Dartmoor Pony Training Centre - Re-homing Blog: Rowan x Gone off to his new home yay! This lovely black chap (with a couple of white hankerchiefs, incase you want to do coloured classes lol) is Rowan he's 2 and a bit years old and around 12hh high at the moment. 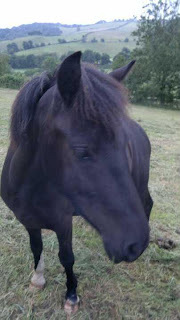 He is really handsome chap and has a lovely mellow temperament. He can be a bit of a teenager sometimes but is very easy to pursuade! He'll make a great riding or driving pony. Needs to get better at having feet handled but very good at catching and leading. Since Hobo arrived from the main fields Rowan has become something of a protector, they can often be found together with Rowan standing guard over Hobo while he sleeps, it's very sweet to see. I guess their lookalike colours means they have formed a secret pony society lol.